The MK2 model X1 uses BMW's more efficient generation of four-cylinder engines. Plus the brand's intelligent all-wheel-drive system, which distributes the engine's power between the front and rear axles as the situation requires, has been upgraded. Most buyers though, will be happy with front-wheel-drive. The Munich maker promises that its baby SUV's ride and comfort has been 'noticeably' improved and its sporting credentials beefed up by the increased rigidity of the body and chassis. There's also a wide track, short overhangs and the usual 50:50 weight distribution. Engine-wise, the mainstream range offers one petrol option and three diesel units, all of which are 2.0-litres. The sole xDrive20i petrol variant is powered by a 192bhp four cylinder unit that only comes mated to eight-speed Steptronic auto transmission. It sprints from 0-62mph in 7.4 seconds. Also auto-only is the powerful 231bhp xDrive 25d diesel version. Most X1 sales will be made further down the range with the lesser diesel variants. 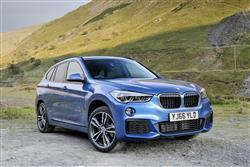 There's the choice of a 190bhp 4WD xDrive20d model. Or, if you can't stretch to that, a 150bhp 2WD sDrive18d diesel option. The 2WD '18d' makes 62mph in 9.2s, a figure the 4WD '20d' variant improves to 7.6s. With the xDrive 20d, there's the option of that Steptronic auto gearbox as an alternative to the usual slick 6-speed BMW manual stick shifter. This MK2 model X1 is unmistakably a BMW, its front defined by the large upright kidney grille, a three-section lower air intake and a characteristic 'four-eyed' look formed by the twin circular headlights and foglamps. This second generation design has grown most notably in height - it's more than 53mm taller than its predecessor - which obviously helps to create more room inside. In that cabin, there's BMW's usual fine balance between driver focus and practical elegance. The flat surfaces of the instrument panel and centre console controls are angled towards the driver, while the controls located in the lower section are surrounded by quality surfaces and are separated from the front passenger side by a smartly-designed bar. The instrument cluster, consisting of two circular instruments and framed by a small binnacle, also helps the driver to focus on the driving experience. Meanwhile, the iDrive operating system's control display comes in the form of a 6.5-inch (or optional 8.8-inch) freestanding monitor. Satnav is standard. Although the new X1 is slightly shorter overall than its predecessor, there is, as we've said, more space for passengers and luggage. The seating position has been raised - by 36mm in the front and 64mm in the rear - and there's increased headroom, shoulder, elbow and knee room. Boot capacity has increased by 85-litres to a much more practical 505-litres. It can be upped to as much as 1,550-litres by folding down the standard 40:20:40 split rear seat. A 60:40 split-rear bench is an option that can come with individual elements able to slide the seat forward or back by up to 13cms. Expect to find pricing at similar levels to that of the previous MK2 model, which means a typical span in the £25,000 to £35,000 bracket. The standard specification is pretty complete, running to include BMW's iDrive operating system with its high-resolution 6.5-inch colour display, a six-speaker audio system, plus a USB socket. Also standard are LED daytime driving lights, an automatic tailgate, front foglamps, remote-controlled central locking and keyless ignition, plus electric windows, electrically adjustable and heated exterior mirrors and a leather steering wheel adjustable for height and reach. The various 'xLine', 'Sport Line' and 'M Sport' trim levels are differentiated by different colour grilles, side skirts and air intakes, as well as by various different kinds of sports seat. 'M Sport' models are fitted with a model-specific aerodynamic package and 18-inch or optional 19-inch light alloy wheels. The 'xLine' and 'M Sport' models get full-LED headlights for low and high beam, an optional feature for 'Sport Line' models. Options across the range include a panoramic glass roof, a DAB radio, a larger control screen and a Head-up display. The good news for prospective owners is that the BMW's increased performance has been matched with lower fuel consumption and emissions - up to 17% lower, depending on the model. The 2.0-litre petrol X1 xDrive 20i model is quick, but its official combined cycle fuel consumption is 44.8mpg, with CO2 emissions of 146g/km. Turbocharging and common-rail direct injection imbue the preferable diesel engines with improved efficiency. With auto transmission as standard, the 231bhp xDrive 25d diesel variant posts a combined cycle fuel consumption figure of 56.5mpg and CO2 emissions of 132g/km. The 190hp xDrive 20d diesel posts figures of 57.6mpg and 128g/km. Of course, you'd expect a switch to front wheel drive to yirld you lower running cost, and sure enough, the base sDrive 18d diesel variant provides exactly that, returning 68.9mpg and 109g/km. xDrive18d models and xDrive20d will be launched in November, also with the six-speed as standard. All these figures assume that you've chosen to use the standard 'Drive Performance Control' system in its most frugal 'ECO PRO' setting. To buy this X1 in its original form, you needed to be sold on the idea of a BMW and be possessed of a budget not quite generous enough to get yourself the kind of larger X3 model you'd ideally have chosen. In this much improved second generation form however, this car has set its sights a little higher. Yes, there are smarter and more purposeful-looking SUVs and Crossovers you could buy for the same kind of money, but against those, this BMW offers a range of unique selling points. It's alone in this segment in offering the option of a rewarding rear-wheel drive layout. And a far smoother and more sophisticated 8-speed automatic gearbox. Plus you get ride quality that's arguably best in class. It all adds up to a car now very well worth short-listing if you're looking for a satisfying ownership proposition amongst the many compact SUVs and Crossovers now on sale. It still isn't an obvious choice. But now, it's one you might just enjoy making.